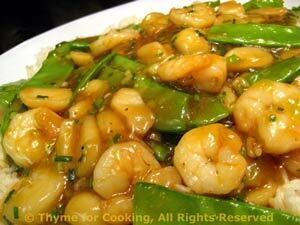 Stir-Fried Shrimp with Snow Peas Thyme for Cooking easy spring main course. The bright green pea pods make this a showy dish, delicious served on fluffy, fragrant Basmati Rice. I don't normally use all of the water chestnuts in the can - mon mari snacks on them. Use as many as you like. Peel and clean shrimp if needed. Trim the green onions, slicing off the root and removing 1 layer. Thinly slice, using some of the darker green. Mince garlic and ginger (peel it first). Trim snow peas, cutting the ends off. Open and drain water chestnuts; slice the large ones. Dissolve cornstarch in soy sauce and water. Heat butter and oil in a small saucepan over medium heat. Add stock, cover and cook rice for length of time on package. When done fluff with fork. Heat oils in large nonstick skillet over medium-high heat. Add onions to skillet and stir-fry for 30 seconds. Add garlic, ginger, shrimp, stir-fry 1 minute, until shrimp start to curl and turn opaque. Add snow peas, water chestnuts, and stir-fry 1 - 2 minutes. Add chicken stock and sherry, bring to a boil. Add cornstarch mixture, stir until cleared and thickened. Arrange Basmati on a large platter. Spoon Shrimp and Snow Peas on top and serve.